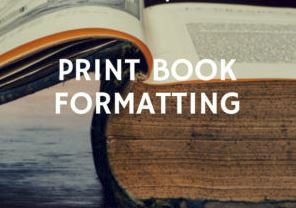 Formatting a book for printing requires more thought and work than publishing an eBook. Following are some things you need to think about. Okay, you’ve written, edited, and rewritten your text (maybe even several times). It’s now ready to go to press. If you want to self-publish a print book, there many options to choose from, including how it’s distributed. Examples include Kindle Direct Publishing (Amazon), IngramSpark, Lulu, and Lightning Source. Their procedures are fairly easy to follow and there are lots of sources of online help. When you self-publish, you have to make multiple formatting decisions. Every paragraph, heading, graphic, etc. needs to have a specific style assigned. You need to consider the interior book design and the cover design. Let’s start with some of the basic issues. This is not an eBook, and some of the fonts that are designed to be easy to read on an electronic screen (e.g., Arial), may not look good in print (depending on your topic and reading audience). A print book usually involves longer reading time than looking at a screen, and under various lighting conditions. That means that the font you choose needs to allow the readers eye to flow easily through the text. A serif font (one with letters that have a small line or stroke attached) are the usual choice for the body of print books. There are lots of options (e.g., Times New Roman, Garamond), which you can explore online. You may also want to consult with your book printer. Chapter titles, headings, and other special text can run anywhere from sans serif fonts (e.g., Arial) to gothic and other exotic fonts (without getting carried away). Many of these fonts are free, but you may want to explore fonts that must be paid for. If you plan to publish a number of books over time, this may be a good investment. With a font style selected, you now need to decide what size the font should be. Common sizes range from 10-14 points. One parameter that may influence your thinking is that the larger the font you choose, the more pages will be required or it will require a larger book size (see below). But a smaller font size (to save pages) may be more difficult to read. You might want to experiment with various font styles and sizes. Print several pages of text and compare them. Ask family, friends, or colleagues to read them and give their opinion. The final decision should be based on readability. The combination of font style and size should make getting through your text both comfortable and effective. This topic covers both horizontal spacing (between characters and sentences) and vertical spacing (between lines of text and paragraphs). This is something that most authors don’t mess with. However, you may want to change this parameter for certain chapter titles or headings, for example. it’s not hard to do. In Microsoft Word®, open the font dialog box and click on the Advanced tab. Click on Kerning for fonts, and choose the minimum size for which to apply it. The combination of font style, font size, and kerning you choose should create about 65 characters per line of plain text, including spaces (obviously, that probably won’t apply to headings, captions, etc.). The “old rule” was two spaces between sentences (i.e., after the period or other ending punctuation mark). This rule was created in the mechanical typesetting era, when all letters were monospaced (the skinny “i” and the wide “w” took the same horizontal space on paper). To emphasize the different spacing of characters and sentences, the two-space rule was established. However, with today’s electronic typing, current style guides suggest using only one space between sentences. If you forget this and fall back to double spacing between sentences somewhere in your text, or if you just want to check, try this suggestion. In your word-processing software, go to the “find and replace” option and simply find all double spaces and replace them with single spaces. This term comes from the days of hot metal type, when strips of lead were placed between lines of type to provide line spacing. In Microsoft Word®, changing line spacing is simple. Just go to the paragraph dialog box and look for Spacing. You’ll also have to decide on your paragraph style. For example, will your paragraphs be indented? All of them? Or only those after the first paragraph in a section? Or will you use block paragraphs (no indents), which require more paragraph spacing than your normal line spacing. As with font style and size, you may want to print several pages to test various combinations of horizontal and vertical options. And again, ask people you know to give you their opinion on which has the best readability. As a guide, many 6 x 9 paperbacks have 30-40 lines of plain text (no headings or graphics) on a page, such as in a novel. This will also depend, of course, on the margin sizes you choose (see below). The number of lines per page for non-fiction books, which will often contain multiple headings and various kinds of graphics, will vary. There may also be a need for some white space around photos or figures. This is the physical dimensions of a book, In inches. Common sizes are 5.25 x 8, 5.5 x 8.5 and 6 x 9, although many other sizes are available to choose from (check with the company printing your book). A popular choice for books with lots of text is 6 x 9, especially nonfiction. And take note: A book with a larger trim size won’t require as many pages. So, it’s a trade-off between book size and number of pages. The cost of each of your options may influence your decision. When push comes to shove, you may want to choose a trim size that’s been used by your major competition. Most raw manuscripts (created, for example, using Microsoft Word®) are typed with a 1-inch margin top & bottom and left & right. However, when you’re about to print your book, you need to make some important decisions about those margins. To experiment with various sizes, it’s a good idea to use the Save As function to create a safe document you can play with. Start by changing the paper size of your text to the book size you’ve decided on. In Microsoft Word®, these changes are done in the Layout tab. Click size and then click more paper sizes. Insert the dimensions of your book size (be sure to Apply to: whole document). Next, click on the margin tab (still within the Layout menu). There are four margins to be concerned about. The first two are top and bottom margins. These can be any height, within printing constraints. Some designers prefer the top margin to be larger than the bottom margin, while others prefer the reverse. Or you may choose to make them the same. A lot depends on the content (if any) within these margins (e.g., , book name, chapter name, page number). The next one is the outside margin (left side of a left page; right side of a right page). This may run from 1/4 inch to 1/2 inch or more. On some inexpensive paperbacks, it may be as small as 1/8 inch. This issue is part of interior book design, which you may be doing yourself—or you may choose to use an outside book design specialist. Another option is to look at lots of books in your genre to see what others have done and what looks good to your eye. The last one is called the gutter—the inner margins (right side of a left page; left side of a right page). Usually, the more pages there are in a book the larger the gutters need to be. This is to allow readers to read all the text on a page without breaking the spine of the book. Once again, look at print books to see what choices were made for each margin and which you like. Experiment with each of these margins. Insert whatever text, if any, will go inside the top and/or bottom margins. In Microsoft Word®, go to Page Setup, then Margins. Choose Mirrored. Then try different dimensions. Don’t forget to adjust the gutter size for your book (lots of pages mean a thick spine; so, go with one inch or more). Remember: The impact of margin size choices will affect how many lines or words there will be on a page, and hence the number of pages in your printed book. All of the above parameters have an impact on the readability of your book. As someone once said, “Choose wisely”.